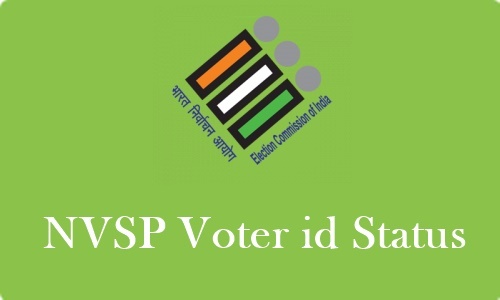 NVSP Status Check 2019: National Voter Service Portal (NVSP) is the official portal of India that permits the Indian citizens to enroll the new voter identity cards and to check the name in new voter id card list. This portal is exclusively meant for the voter ID services for the Indian citizen. The NVSP portal was introduced in 2015 by the Election Commission of India (ECI) to make the voter id cards issue process online. With this portal, the citizen need not visit the BLO or any other officials, instead, they can apply for the voter id cards easily from online. Anyone who doesn’t have enrolled the voter id cards can apply for new voter ids and one can check their application status, approval details from the NVSP Official portal, nvsp.in. Indian citizens who wish to explore more details such as how to apply for vote cards through NVSP portal, how to check the status, what is the eligibility that a person must possess to apply for vote cards, and other details from the following article. How to check the name in the NVSP Voter list? On the homepage, Click on “Search Your Name in Electoral Roll” link at the left side of the website. Now provide the required details, and fill the correct captcha code and tap on the search button. Now, Check the details. If the user is having the voter id, the details will be displayed on the screen. Otherwise, the voters can apply for the new voter id card from this website. How to check NVSP application status 2019? Voter ID status checking can also be done through the NVSP portal. Now, the voters are hassle-free and need not visit any of the BLO or other departments. Just go through the following steps to check the Voter ID application status. Initially, visit the NVSP official portal, nvsp.in. Upon visiting the portal, search for the corresponding link to check the voter id card application status on the home screen. “Track Application Status” link will be visible on the screen. Now, tap on the link and enter the login credentials, reference id, and other information and click on “track status” button. Now, check the application details from the screen. And contact the NVSP authority through the helpline numbers if any help required. The NVSP portal lets the users apply for the new voter id cards. Follow the procedure given below to apply for new voter id cards. Initially, visit the NVSP Official portal, nvsp.in. On the homepage, search for “Apply online for registration of new voters” i.e. Form6 link and click on the link. Fill Details – Form6 such as current address, personal detail, permanent address, other necessary specifications and as well attach the required scanned copies of documents. The last step is a declaration. Users have to ensure all the details filled correctly and have to click on the “replies”. The applicants will be issued voter id cards within a few days after filling up the application forms. Until then the users can keep tracking the status of their application. Now, Fill up this form and attach supporting documents like FIR, Address and Identity Proof whatever necessary. The applicants will be provided with reference number after submission of application form. After certain verification, your application is passed to the next level. Now, the users can track their duplicate voter id status by visiting the NVSP portal. Applicants will be received the voter ID card SMS alert when it is ready. Visit the specified electoral office to collect the duplicate voter id card. Applicants can apply for the vote card with no fee. It is absolutely free to apply. By visiting the NVSP official portal users can track their voter id status whenever they wish. Also, new voter id application is easy through the NVSP portal. Applicants have to make sure to fill up the correct details while filling up the voter id application form and also attach the relevant documents. Upon successful application of voter id cards, the users will be given reference id. Use the reference id to track the application status. Applicants have to fill the applications correctly while applying. After the application also the users can check the details. If any corrections, spelling mistakes are there they can correct the details by visiting the portal and uploading the relevant forms. Applicants will be provided with the voter id cards only after the verification of documents and details. The age of applicants must be more than 18 years. The applicants need to have been financially bankrupt and free from criminal charges. The NVSP portal provides a large number of services for Indian citizens. Not only applying for the voter id cards, but the NVSP Forms will also be provided for various purposes. By tapping on the particular form, the users can fill that form. For instructions, guidelines, and complaints, the users can contact the NVS Customer care. 1.1 How to apply for Duplicate Voter ID Card?